Where do you get art and culture, crafts and folklore, warm sunshine and cool nights, colorful water bearers and mouth watering sweets, hustle and bustle yet with peaceful oases-like gardens? After much vacillation, Srijith and I picked Marrakech as the destination to celebrate the end of an eventful 2007. We arrived at Marrakech on a bright sunny Christmas morning â€“ the contrast could not have been starker â€“ from grey wintry Amsterdam to bright sunny Marrakech, from Christmas dÃ©cor at every street corner to a country which seemed collectively oblivious to the commercialization of Christmas, from bicycles and bakfiets on the streets to mule-driven carriages and old men pulling handcarts. 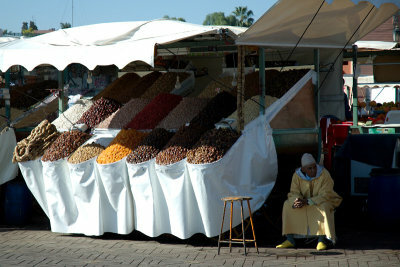 Marrakech is the capital of Southern Morocco. It was once the capital of all Morocco, a majestic city that could hold its own among the large Moroccan cities of Fes, Meknes, Rabat and Casablanca. The fortunes of Marrakech have risen and fallen over the last thousand years, as it was attacked, dominated, and then lovingly rebuilt by its many conquerors. From the Phoenicians to the Romans to the Byzantines to the Vandals and to finally the Arabs, this Berber metropolis has seen many visitors â€“ wanted and unwanted â€“ and yet managed to retain a culture and tradition that is uniquely its own â€“ a splendid mix of its nomadic Berber roots blended with all that came after. The Riad where we stayed at, Dar Ihssane, is one of the many old townhouses that have been converted into convenient accommodations for the increasing numbers of tourists, who come here in search of something old and something new. 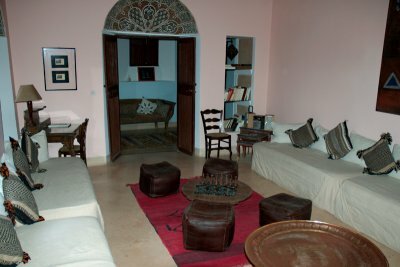 Unrivalled in their personable service, Riads also offer the tourists an opportunity to experience traditional Moroccan living, and to examine and appreciate at close quarters the colors and crafts that seem to adorn even an ordinary manâ€™s humble abode. Dar Ihsanne, also provided us with the occasion to have an excellent home-made Moroccan meal, specially cooked for us by our housekeeper, Hanane, under a starlight Mediterranean sky. Just a stoneâ€™s throw away from our Riad was Djemaa El-Fna. The Djemma El-Fna is not a place to visit, but an experience to relish. A vast open-air square, with thousands of stalls, vendors and buskers active at any time of the day or night, the El-Fna is a pandemonium of every imaginable sound, sight and smell â€“ Here, you can buy almost everything from rare spices to old quaint coins to herbal medicines in shady bottles; delight in any experience from snake charming to henna tattoos to belly dancing; savor whichever taste appeals your palette â€“ from disconcerting lamb heads to innocuous salted snails and mouthwatering sesame sweets. 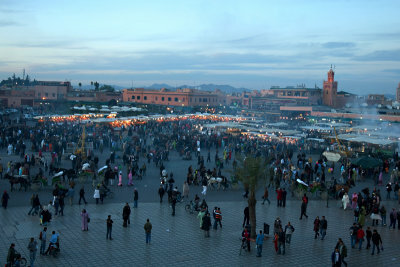 The Djemaa El-Fna, flanked by the distinctive Koutoubia Minaret is undeniably the icon of Marrakech and probably the first image every visitor would conjure up when they think of their time spent here. 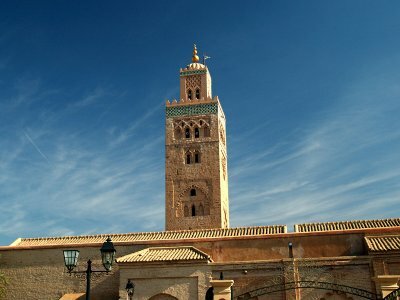 The Koutoubia minaret, with intricately carved cedar wood steps and minute gold, silver and ivory marquetry, is supposed to be a jewel of Islamic art â€“ unfortunately only Muslims are allowed inside the mosque. However, even the views from outside are well worth a visit. The three golden-brown globes on top of the minaret are said to represent the three principles of Islam â€“ Faith, Prayer and Fasting. Legend has it that they were made by melting the gold jewellery of the wife of Yakun ul-Mansur, the Almohodan ruler who finished the mosque in 1189 AD. To ensure that they would never be stolen, a genie has been enslaved by a magic spell, and forced to keep watch over them. And anyone who attempts to approach the globes with less than noble intentions would have to suffer the wrath of the eagerly waiting genie. 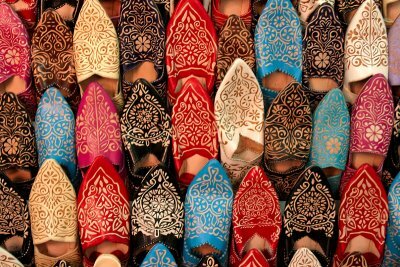 This is one of the many examples of Arabian and Berber folklore that are a part and parcel of Marrakech life. 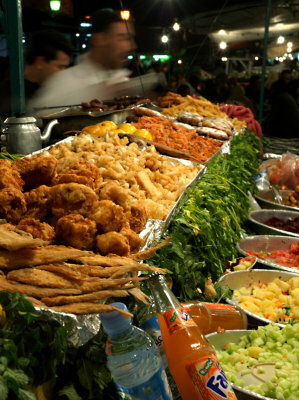 You donâ€™t have to be a food fanatic to fall in love with Moroccan food. There is something for everyone here. Tagines seem to be an all-time favorite â€“from the Berber variety which consists of chicken cooked in a clay dish with carrots and potatoes to the more exotic Tagine Morrocaine, which is meat cooked with lemon and a generous splattering of green olives. Also worth trying are the local varieties of couscous, pastilles and briwatte. The best beverage to have with or after the meal is the ubiquitous mint tea, which turned out to be a tad bit too sweet for my taste. Unapologetically sugary and sinful, Moroccan sweets are definitely not to be missed. Most restaurants would offer an assortment as dessert, so as to spare you from making such impossibly difficult choices. Arts and crafts are a major part of life here – more than half of the people of Marrakech apparently earn their living from the crafts. Perhaps because of the Islamic tradition of never depicting the human figure, much of the ingenuity and creativity of the arts here seem to have been directed at depicting the world outside. Repetitive patterns, geometric shapes and multitudes of bright colors make the designs unique and surreal, often reminding one of infinity with all its grandiose. 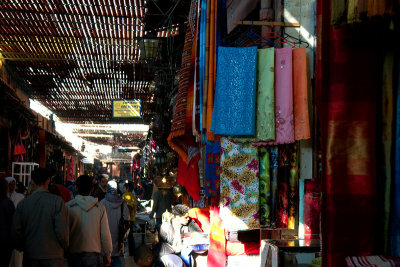 Apart from the souks, one place to buy the wares at fixed prices and to watch artisans at work, would be the Ensemble Artisanal, a state-run artisansâ€™ complex, which is about 10 minutes walk from the El-Fna. I will visit this beautiful and very interesting city sometime.